The phenomenally talented and fellow Canadian M-R from Quilt Matters asked me awhile ago if I’d be interested in hosting an episode of TGIFF and of course I said yes! It’s the first time I’d been asked to participate in anything quilty since I started this blog and was/am honored! Since that invitation, I’ve started a new job which has been keeping me running from 7:00 a.m. till 4:30 p.m. which makes for a long, exhausting day albeit very rewarding. The first week was rough but three weeks later, I’m really starting to enjoy myself despite the hefty work load. Two weeks ago I started making a pillow cover for my Mom for Xmas. I sent a photo to my sister and she immediately claimed it as her own. Not only that but she wants a second (pillow cover) AND a sofa throw! Recognize the fabrics? 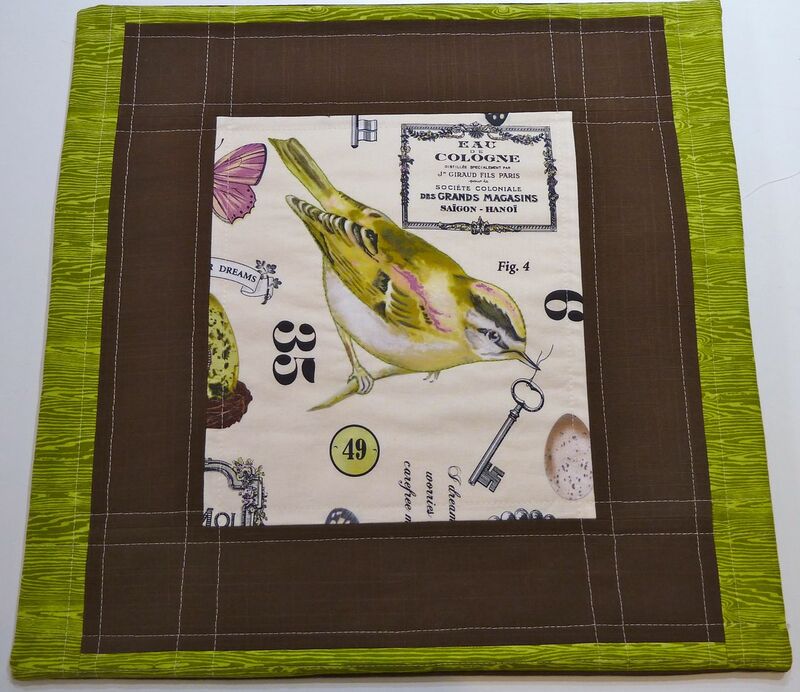 Taking center stage is Paula Prass’ Wing Study in Pastille, the chocolate brown border is part of a linen curtain from Ikea and the perfectly matching green is, of course, is Wood Grain in Dill by Joel Dewberry. The second pillow cover utilizes Joel Dewberry’s Herringbone in Pond which matches the blue in the crown above the bird’s head perfectly! 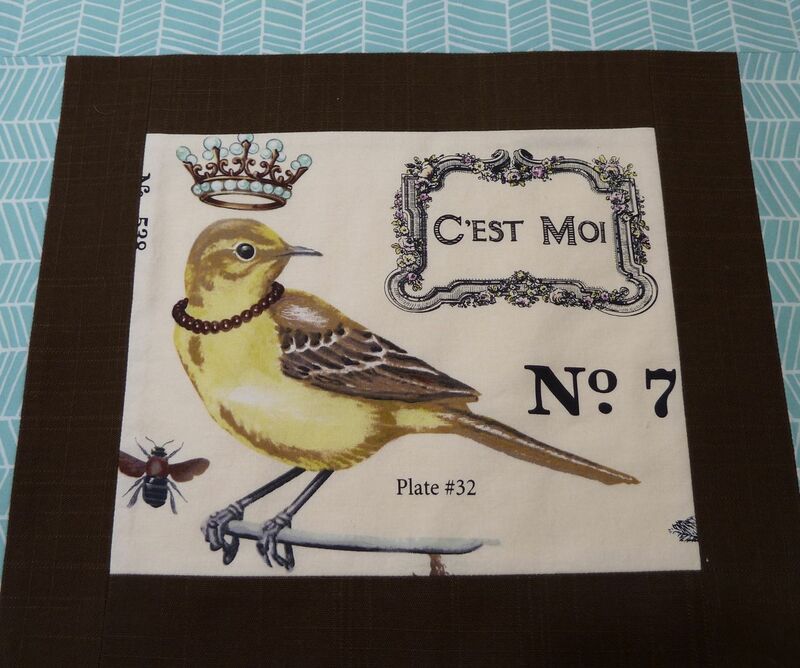 I did a little hand stitching around the birds, don’t know if it makes much difference but I enjoyed the practice. Link up those fabulous finishes here and don’t forget to tour the other finishes and spread the comment love! Please include a link and/or button for TGIFF! (it’s just over there in the right hand sidebar) so your visitors can see other fab finishes. By the way, I don’t know why the link icon displays 0 links in collection as we now have 14 fabulous finishes! This entry was posted in Pillows and tagged ikea, Joel Dewberry, quilt matters, Thank Goodness it's Finished Fridays! by Tabatha. Bookmark the permalink. thanks for hosting for us btw! i have one more side of the binding to stitch down, take pics and then post about it! i may not be done by the end of Friday in Australia.. but maybe in NY..
I’ll be back to link up when i’m ready! These are so beautiful! I adore the birds and the Joel Dewberry works so perfectly – I think Herringbone is one of my favourite prints! The pillow covers are just great! I finally got my link added, now I’m going to click again so I can go view all the other listings.